The Hillary Clinton-controlled DNC is beginning to crumble, and it’s no surprise why. Crony-capitalism simply does not work. Senate Minority Leader Harry Reid gave a harsh criticism of Bernie Sanders the other day regarding Sanders’ apparent lack of empathy or apology for Sanders supporters at the Nevada DNC last weekend. However, it should be no surprise that Sanders refuses to apologize, especially when the democratic process was completely ignored that day. But that criticism is only the tip of the quickly melting iceberg that will soon flood the halls of Wall Street as more and more Americans are beginning to feel the Bern. A Nevada Bernie delegate, Angie Morelli, has received substantial airtime on the mainstream media, particularly MSNBC, explaining what really happened there from her first-person perspective, and slammed political news reporter John Ralston for making claims about the event without talking to her or any of the other Bernie delegates first. A major concern that Morelli brought up in an interview with Rachel Maddow was that the Bernie supporters at the NV convention had a stack of petitions regarding the political process within the DNC, petitions which Hillary supporters were explicitly told not to sign. When those Hillary supporters asked what was in the petitions and found out what they were, they wanted to sign the petitions and everyone wanted the NV DNC heads to respond to the petitions, but they refused to. What’s more is that Bernie himself explained that he’s seen absolutely no reports of violence from Sanders supporters at any event since the campaign started through the present, despite Nevada DNC head and Debbie Wasserman Schultz claiming the contrary. Sanders also said in a statement that the opposite was true, that his Nevada campaign office had been shot at and ransacked. All of this is besides the point, however. The real issue is that the people at the top of the DNC are involved in what has become the most widely publicized and anger-inducing crony-capitalism scheme ever in recorded history of the United States, mostly due to the Bernie Sanders campaign exclaiming it over and over, along with underground news sources and smaller legitimate source doing investigative reporting. Democracy Spring, a grassroots organized protest proclaiming our right to democracy, may have been a quickly defused outcry from the disenfranchised, but it’s far from over. Even as you read this, the organizers in California are gearing up for multiple massive events. There is still quite a lot of delegates up for grabs on June 7th and a quick look at Bernie’s event map will tell you he has no plans to stop working towards winning the primary. There’s even a musical concert being announced on May 30th from a new band with members of Rage Against The Machine and Public Enemy, an event sure to show strong support for the working class of America. The main reason is that the people who are in charge simply don’t realize how out of touch with reality they really are. People have registered to vote in record numbers this year. The Democratic Party has received an extremely large number of new voters, and quite a few seasoned Democrats are steering away from the party after witnessing the widespread voter suppression, election rigging and general disenfranchisement from DNC party heads. 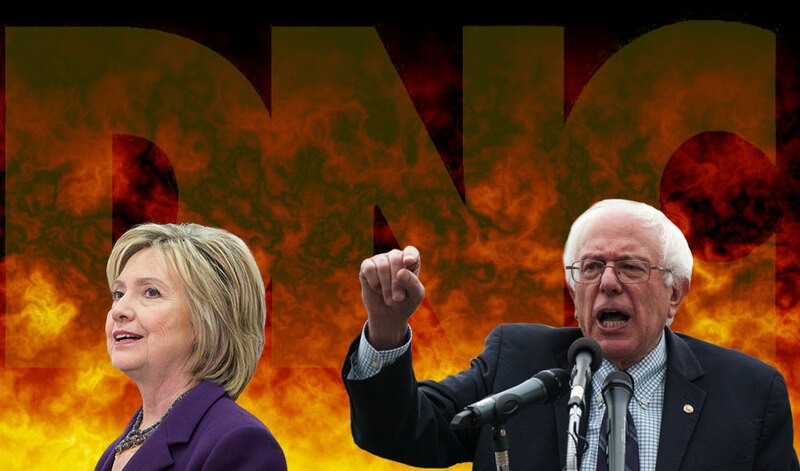 If Bernie Sanders doesn’t get picked as the Democratic Nominee, the DNC will fall completely apart.